Football is a game of innovation. The quick and malleable prevail over those stubborn and unwilling to change. 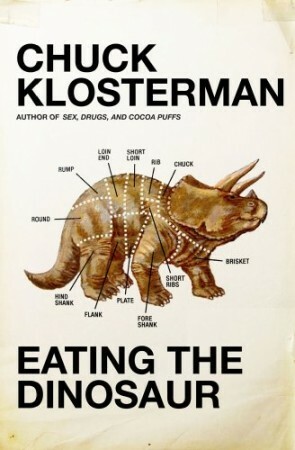 Or at least that is what Chuck Klosterman is telling me in “Football,” an essay from his new collection Eating the Dinosaur. Klosterman leads with the read option, its various uses and how it is implemented in modern football. His example is Michigan vs. Minnesota. From there, he leads into the progressiveness of football, from the adaptation of the forward pass to the use of technology like instant replay. “If football was a politician, it would be some kind of reverse libertarian: staunchly conservative on social issues, but freethinking on anything related to policy,” Klosterman writes. Gus Malzahn, the unheralded offensive coordinator at the University of Tulsa7 who took Wyche’s hurry-up offense to its illogical extreme: The goal of Malzahn’s approach is to play at full speed at all times, lengthening the game and wearing out opponents mentally and physically. As a high school coach at tiny Shiloh Christian in Arkansas, he once won a play-off game by a score of 70 to 64. In that contest, his quarterback passed for 672 yards. Tulsa averaged 47.2 points per game in 2008. The whole is basic Klosterman — seemingly ridiculous summations that somehow, on the skill of his writing, wrap into a comprehensible essay. Football’s progressiveness is his explanation as to why he — a hip, smart, witty 37-year-old — enjoys watching a sport often classified as barbaric, violent and brutish. The premise is not earth shattering: football is a game of innovation. Duh, says the collective football fan base. But the interesting part, the part that makes college football specifically compelling, is its participants willingness to innovate. Auburn vs. Alabama, for instance. Auburn under Gus Malzhan is everything Tony Franklin Auburn wasn’t — fast, up-tempo, chaotic, productive. Alabama under Nick Saban, and offensive coordinator whomever, is the opposite — controlled, focused on time management and field position. There are advantages to both. If you’re Alabama and you’re redshirting five-star players, running directly at and over opposing teams works. Auburn’s defense didn’t look particularly surprised by anything Alabama did, even on the last drive. Saban seems to believe in the Vince Lombardi school of coaching: run only 15 different plays but run them to perfection. That’s not to say “innovative” offenses don’t do the same thing; the entire Leach system is based around creating match-up problems. Leachian football shows a lot of different formations but has few plays. This might be oversimplification, but that’s what the spread is: getting your best athletes in favorable matchups. Alabama also knows this: in the second half of the Iron Bowl, Julio Jones consistently lined up in the slot, which often matched him with a linebacker or safety. But the Alabama offense, with its straight-ahead running and play-action rollout drags to the tight end, is an offense of limited potential. Alabama vs. Tennessee, for example – a game involving two similar strategies which led to a boring (my Tennessee friends will disagree) game. When athletes are similarly skilled, like Tennessee’s then defense and Alabama’s offense, and the coaches are similarly capable, things slow down, result in a lot of punting, and 12-10. It’s an unstoppable force meeting an unmovable object. Auburn, however – and this is where the bias comes on strong – has no limit. Who knows what Gus Malzahn is going to do? Maybe not even Gus Malzahn. Once Chizik and Co. start rolling with recruiting, once the depth and talent level approach something close to even, things are going to start getting real in Auburn. Or at least Gene has Auburn fans believing. And that’s more than we had this time last year. Hey, Ben. Followed your link over to Pigskin Pathos. Hopefully this will give me something to read during the dreaded off-season when the only material to keep me going is recruiting news. You seem to do a lot of interesting reviews and other musings to keep us intelligently entertained. “kicked down the door” may be a little strong. We still lost the game. We did at least KNOCK ON the door though. It’ll be knocked down when the Tigers are playing in the dome with a chance to go to the BCSCG.